The Philips Avent Bendy straw cup with ergonomic handles is ideal for first sips from a straw and allows healthy oral development. 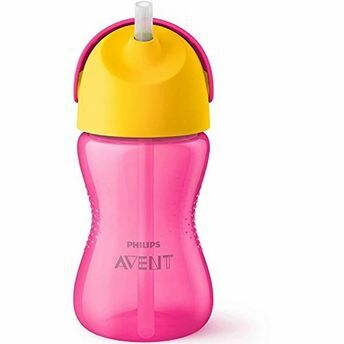 The Philips Avent Bendy straw cup with a contoured shape is the ideal choice for growing, active toddlers. This straw cup is leak proof and helps your child to independently use the cup. With it's unique twist lid, it reduces the hassle of cleaning the cup as it is fully disassemble-able and cleanable. The straw cup is the perfect size to keep your child hydrated throughout day and during active times. The flip top design keeps straw clean when out and about. The cup's contoured shape and anti-slip texture make it easy to hold and grip for small toddler hands, enabling your little one to confidently develop independent drinking skills.